Lockheed Martin (NYSE: LMT) has selected Raytheon and a Northrop Grumman/Ball Aerospace team to compete as potential mission payload providers for the U.S. Air Force’s Next Generation Overhead Persistent Infrared (Next Gen OPIR) Geosynchronous (GEO) Block 0 missile warning satellite system. 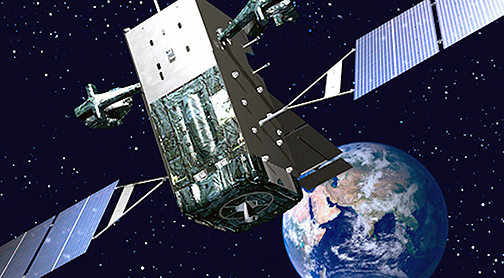 Artistic rendition of the Space Based Infrared System satellite. This payload competition between Raytheon and Northrop Grumman/Ball Aerospace will be executed as part of the Phase 1 contract for the Air Force’s Next Gen OPIR Block 0 GEO satellites. The competition includes development scope through the Critical Design Review (CDR) phase. As part of a program heralded by the Air Force as a pacesetter for “Go Fast” acquisition, Lockheed Martin selected the two suppliers on September 28 — just 45 days after the company’s own prime contractor award. The U.S. Air Force awarded Lockheed Martin the contract for rapid development of the Next Gen OPIR Block 0 GEO system on August 14. The Raytheon and Northrop Grumman/Ball Aerospace teams were selected due to their ability to meet stringent schedule and capability requirements. They are now tasked to develop detailed designs and compete their solutions for potential use on the Next Gen OPIR Block 0 GEO satellites. A final down-select is expected at the end of the CDR phase in 2020. Next Gen OPIR is a new missile warning satellite system acquisition program that will deliver advanced capabilities to keep pace with adversary advancements. It will succeed the Space Based Infrared System by providing improved missile warning capabilities that are more survivable and resilient against emerging threats. The Air Force implemented Next Gen OPIR as a rapid acquisition program with Lockheed Martin targeting the first GEO satellite delivery in 60 months. Lockheed Martin is working with the Air Force on a variety of initiatives to increase the speed of satellite acquisition, including introducing more commonality of parts and procedures into production, building predictability into schedules and supply chain orders, and incorporating additive manufacturing. Tom McCormick, Lockheed Martin’s VP for OPIR systems, stated that NexGen OPIR is a crucially important program for the nation, with a challenging schedule and set of technical and resiliency requirements, different than prior programs. The company recognizes that this is a watershed program for the U.S. Air Force and understand the need to ‘Go Fast’ to ensure the national security posture stays ahead of emerging global threats.